Save money, scale easily, and simplify administration with our affordable SIP services. Low-cost, flat-rate SIP trunks work especially well for small businesses. SIP trunking also provides low per-minute costs for offices with higher call volume. Purchase the right number of call paths for your business, and when your call volume increases, simply add more paths. Rather than having redundant phone and data networks, use SIP trunks over your Internet data connection. This gives your office a single, IP-based network. Unlike traditional phone systems, you can have a new trunk in hours, not weeks. SIP supports the latest unified communications features, including presence, call pairing, and even integrated video, allowing you to work more quickly and efficiently. SIP calls on IP PBX can sound dramatically better than old fashioned analog calls. 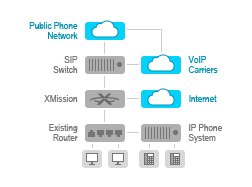 In the event of an emergency, XMission can quickly reroute your SIP trunks. A central PBX can reroute in real time if an extension becomes unavailable. Bridge together your remote offices through a central IP PBX. Dial extension-to-extension to a distant branch. Major providers have initiated system-wide transitions to IP based phone protocols. SIP prepares your business for future innovation. A PBX uses trunking to send and receive phone calls. A SIP trunk provides this service by using IP (Internet) rather than the legacy switched telephone network. SIP trunks are typically faster, easier to use and less expensive. A SIP trunk can provide dial tone for both IP and traditional analog PBX. As with analog trunking, one SIP trunk allows for one phone call. Why Choose SIP Trunking Over Analog Circuits? SIP trunks have superior call quality, are easier to install, and easily integrate with IP PBX to allow the advanced functionality of VoIP systems that are not available through analog systems. SIP trunks are usually much less expensive than SIP trunking, and SIP trunks can operate over your existing Internet connection. What Advantages does SIP Trunking Have Over PRI? PRI are often bunched into groups of 23 trunks via a separate dedicated T1. SIP trunks can be bought as they are needed and may be delivered as priority traffic over a normal or private Internet connection. And typically, SIP trunks have significantly less expensive per minute long distance costs, if any. When Should I Choose SIP Trunking And When Should I Choose Hosted PBX? SIP trunking is for businesses that prefer to operate their own phone system hardware, or who are committed to a legacy system but wish to reduce existing costs without upgrading. Hosted PBX is for new or established businesses that want to save money in the long term while removing the burden of staffing maintenance of a legacy PBX. Does SIP Trunking require special equipment? Any PBX can use SIP trunking. If the PBX is not already SIP capable, it likely has an optional module. For pure analog PBX systems, a simply Analog Telephone Adapter can be installed which converts the digital SIP signal into analog dial tones that connect to your PBX just like a regular phone line. This depends on various factors including the size of the Internet connection, the number of trunks used, the preferred codec and the ability to prioritize traffic at the customer premise. In general, a SIP trunk uses very little bandwidth, and modern HD codecs use amazing compression to provide CD quality phone calls with a tiny amount of data. XMission engineers will help every customer determine what will be the best solution for their office. As your company grows, you can easily scale your IP-based systems. You'll have all of the infrastructure you require for the future in place today. Maintain the same level of quality that you would expect from an analog circuit while saving on long-distance. Plus, you only need to purchase one Internet connection to handle all of your voice and data. Don't worry about investing in new IP-based phones or hardware. Keep your existing phone equipment for an easier transition to IP.